Coord. Chem. Rev., 2016, 306, 331–345. Cyclodextrins (CDs) are well-known molecular hosts for forming stable host–guest inclusion complexes or supramolecular species due to their special hydrophobic internal cavity and hydrophilic external surface. The unique ability of CDs to form inclusion complexes is widely exploited in many areas, e.g. supramolecular chemistry, catalysis, drug carrier systems, food industry and cosmetics. While interactions of CDs with metal ions have been studied for decades, structurally well-defined systems are relatively rare and the application of CDs-based functional materials is in its initial phase. 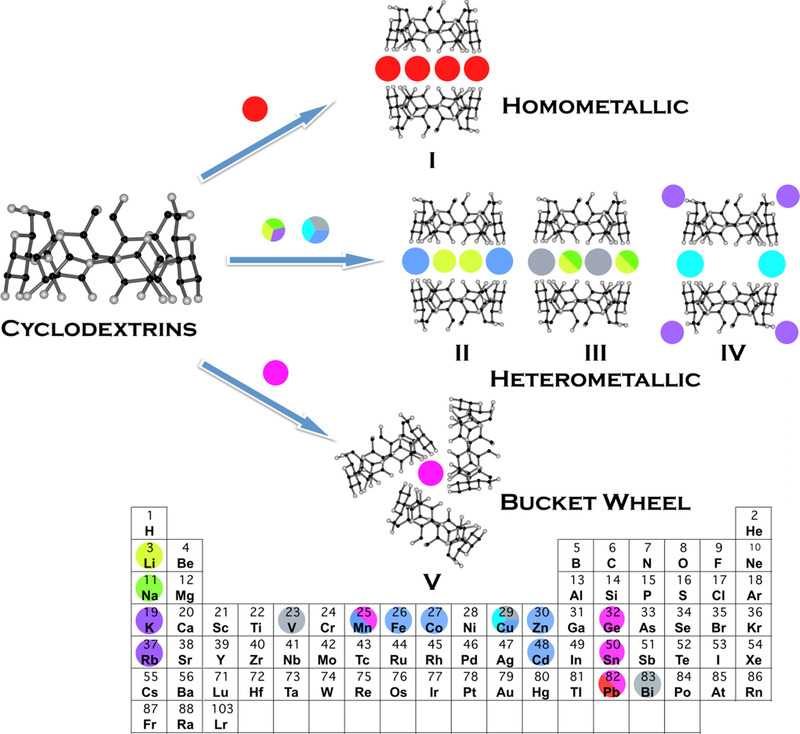 This review focuses on the synthesis, reactivity and structural diversity of well-defined metal complexes derived essentially from native CDs. Various structural motifs for metal complexes based on CDs were delineated ranging from monomeric species, dinuclear systems, homo- and heterometallic sandwich-type complexes to cylindrical, extended structures. The reported examples are discussed with an emphasis placed on how the character of used metal or auxiliary ions, and the formation of intra- and/or intermolecular hydrogen bonds can influence the mode of aggregation and supramolecular arrangement of the resulting metal complexes.